During the Second World War, both Germany and the UK courted Turkey, seeking to draw the country into their respective spheres of influence. One result of this diplomatic manoeuvring was the sale of current inventory front-line fighter aircraft to the Turkish Air Force, despite the pressing need for them at home. Turkey ended up with FW-190 Aa3 and Spitfire Vb aircraft serving side by side during the war, and Spitfire IXs from the end of the war until 1948. The Focke-Wulfs were slightly downgraded from the German standard, lacking the wing root guns and having a different radio installation. They were painted in either RLM 02/71/65 or 74/75/76. Spinners were painted in the regimental colours of either black (Karabaş), red (Albaş) or yellow (Saribaş). At least one and possibly more were painted an overall dark green towards the end of the war but not much is known of these particular machines' history. The Spitfire Vs were clapped-out ex Desert Air Force machines, still fitted with their Volkes filters and desert camouflage. The Spitfire IXs seem to have been drawn from regular RAF inventories, and were delivered in the Temperate Day Fighter scheme. At least two were painted in overall aluminium, most likely the high speed silver lacquer post war RAF fighters wore. Turkish National Markings during the time these aircraft were in service consisted of red squares with a thick white border in the underwing position only, a red rudder with a white crescent and star centred vertically just above the midpoint, and a white or black tactical number on the rear fuselage. With the Spitfire IX, the National marking was added to the upper wings and rear fuselage, and the tail marking changed to a Turkish flag, painted on the fin rather than the rudder. This decal was produced to fit the Tamiya Spitfire Vb (tropical), Hasegawa (or other) Spitfire IX and the Tamiya FW-190A3. 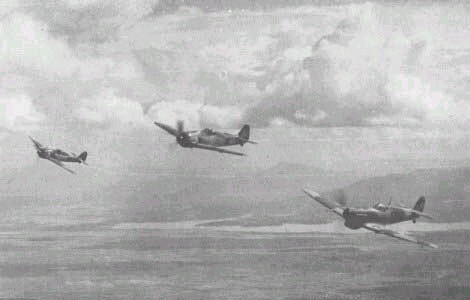 The Spitfire IX's units are not provided. These two aircraft appear to have been fitted with DeHavilland airscrews, which are not present in the Tamiya kit. They will have to be sourced separately. Quickboost offers one in set QB48268. Alternatively, they could be robbed from an Airfix Mk. I if it is built with the two blade airscrew option (or the Tamiya Mk. I if an aftermarket airscrew is used). Black 41 with black spinner 5th Fighter Regiment Karabaş Company. Mottling is not shown on the fuselage side profiles. Pictures in private collections show that there was light mottling on at least some of the aircraft. I have access to photos of Black 11 and Black 41 which clearly show mottling. It is reasonable to suppose that it was done at the Focke-Wulf factory in accordance with standard Luftwaffe practise at the time the aircraft were built. The sheet is crammed with markings. All National markings and tactical numbers for all 10 aircraft have been squeezed onto the standard sized decal paper. All markings are in perfect register, with no blurring or smudging. The fine letters and numbers are crisply printed. The printing was done by Microscale, so we can depend on the decals to be thin and behave perfectly with Set and Sol. There are two small supplemental sheets holding crescent and star markings for YV.85 and MK183, whose tail flashes were printed without them. The instructions come in a full colour 8 page booklet which provides 3 view drawings of each type, with right side views of each decal option. The Spitfire IX and FW-190 have full underside drawings, while the Spitfire Vb drawings have only scrap views of the undersides of the wings. The drawings provide sufficient detail to clearly position all the decals. The instruction booklet appears to have been drawn before the decal was printed. Each National Marking is called out in two parts (eg: H3 H3a), but the corresponding marking is printed as one piece on the decal (there is no H3a, only H3). The FW-190 from the Saribaş Company is supposed to have a yellow spinner. This is clearly printed on the cover page, but its side profile has the spinner printed white. These small errors are easy to reason out, and should not be too confusing. Colour swatches are printed on the bottom of each page with the names of each colour used in that particular scheme. Turkish FW-190s and a Spitfire Vb in formation together. This decal was kindly provided for review by Hobbytime. Lows: Now I need 4 FWs and 6 Spitfires! Small inaccuracies in the instruction booklet. Verdict: This is a refreshing change from Luftwaffe and RAF markings. Our Thanks to Hobbytime Decals! During WWII Turkey tried to remain neutral with a pact with Britain and a non-aggression pact with Germany. Eventually Turkey declared war on Germany on 23rd February 1945. Turkey’s first attempts to acquire Spitfires began before the war in January 1937 when it asked for 30 Spitfire Mk Ias followed by a request for a licence to build another 30. In February 1938 the Foreign Orders Committee discussed a changed order for 50 Spitfires. On 17th November 1938 the request was allotted priority No. 4 by the Foreign Office, for 30+30 Spitfires. In July 1939 Spitfire Mk I L1066 was prepared for shipment to Poland. With the outbreak of war it was offered to Turkey and arrived on the 18th September onboard SS Lassell becoming Turkey’s first Spitfire. In May in40 Turkey requested 45 sets of components for licence building. Eventually a contract of 15 Spitfire Mk Ia was agreed but only two further Spitfires were received, the other thirteen being retained for the RAF. At this time deliveries of Allied aircraft virtually ended as attempts were made to make Turkey break off trade and diplomatic relations with Germany. On 30-31st January 1943 a military agreement was reached between Turkey and the Allies at the Adana conference to supply Spitfire Mk Vb/Trops. These were offered by the British government as Lend-Lease aid but it was not until September 1944 that the first Spitfire Mk Vb arrived. This was followed by a further 69 Mk Vb/c Trops plus one F.IX between November 1944 and May 1945. All the Mk Vs were ex-RAF from the Middle East and were for the most part in poor condition. Some were withdrawn from use within a year and none returned to the RAF. Used primarily for training purposes until they were replaced in 1948-49 by Spitfire Mk IXs and P-47s. A few MK Vcs survived in the Flying School until 1951. Post-war, Turkey obtained 197 ex-RAF Spitfire F.IXc and LF.IXc/es. Off these nine crashed before or during delivery flight. They were flown from England to turkey via Bordeaux, Istres/Marseilles, Corsica, Italy, and Malta. In England the Spitfires were marked with the TuAF national emblems on the wings and fuselage and the Turkish national flag on both sides of the fin but retained their RAF serial numbers. These were replaced after arrival. These were Turkey’s only air defence fighters until replaced November 1954 when they were replaced by NA F-86E Sabres. In the case with relations with Germany, Turkey had the advantage. By 1941 Germany’s resources were badly depleted and wanted to obtain chromium ore from Turkey. At that time Turkey was quite a wealthy country and a normal commercial agreement was out of the question. In return for supplies of ore, Germany agreed to deliver modern aircraft, torpedo boats and tanks. The first deliveries of Fw 190A-3s reached Istanbul in mid 1942. Usually described as Fw 190A-3a (ausländisch, an export version with differences in equipment) everything points to the majority being repaired/refurbished combat veterans. The first batch, sent between August and September 1942, included sixteen airframes produced by Arado. Each aircraft cost 510,000, - RM. A number of pilots were sent to the Fliegerhorst Sprottan flight school in Germany for training and at the same time ground staff were trained at Fliegertechnishe Schule 3 in Munich. Training finished in March 1943. Deliveries continued almost without a break until late 1944. In total 72 Fw 190A-3as were received. They were produced by Arado, AGO, and Focke-Wulf with new Werk Nummer from 0134 101 to 0134 172. Delivery was by sea; the aircraft disassembled and packed in wooden crates. They were accompanied by German technicians who supervised reassembly and then stayed to instruct ground staff. Turkish Fw 190s were fitted with the standard BMW 801D-2 engine and FuG VIIa radios which were already obsolete. Some were fitted with surplus British radios that arrived with deliveries of Spitfires. In August 1944 Turkey was resupplied with a further eight Fw 190As (seven had been lost in accidents) with the following serial numbers: 130404, 130327, 130458, 130501, 130527, 132141, 135344 and 135438. There is no doubt that these were examples withdrawn from service when replaced by superior versions or taken from flying schools. By the end of the war acquiring spare parts, especially engine parts and MG 17 ammunition, was a difficult, if not impossible task. An to attempt install British armament failed. It seems either the German constructors did not want to cooperate with the British armament manufacturers or vice versa. As a result of these problems the Fw 190 was quickly withdrawn from service. The Fw 190 was well liked by its pilots who noted good flying characteristics and ease of control and rated it higher tan the Spitfire. In total, 80 examples were delivered to the TuAF, the last being written off in 1949.